Save the Date - May 17, 2017, 9:00 a.m. The Downtown community will pay tribute to the public safety agencies that serve throughout the city and state with a ceremony and memorial service in partnership with Central Atlanta Progress (CAP) and the Atlanta Downtown Improvement District (ADID), the Atlanta Police Department, the Atlanta Bar Association, and the Atlanta Bar Foundation. 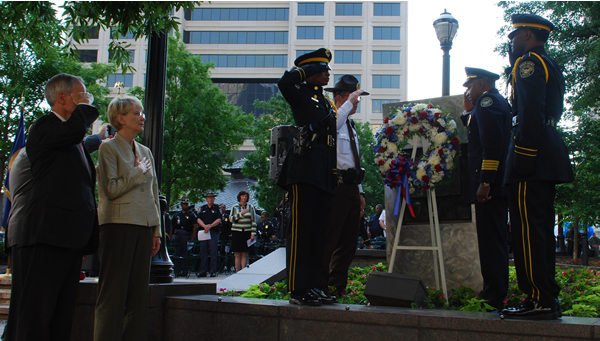 In recognition of National Police Week, members of the Atlanta Downtown Interagency Law Enforcement (ILE) Partnership will hold a public ceremony in Woodruff Park, starting promptly at 9:00 a.m. near the site of the Police Memorial, which was dedicated by the Atlanta Bar Association in 1980. The public is encouraged to attend and pay tribute.